Hot this week: UN bans that that sound great but aren’t likely to do much. A discussion of deaccessioning with the Treasure of Harageh and the Sekhemka case as examples. Some quotes from yours truly. Antiquities of Egypt’s Arish Nat’l Museum safe – Min. Despite recent militant attacks and damage to the building, the artefacts in the Arish National Museum, Sinai, are safe and in stores. Authorities speculated that they were dislodged by tomb robbers. Although this man was found with an unlicensed Maya jade mask on his person, he was acquitted of illicit antiquities charges because he was not formally asked if he had a license for them (although he didn’t have one). A Dutch tourist was caught trying to smuggle the marriage certificate of the son of the Cuban hero out of the country in what seems to be a case of international trafficking of historical documents. A year after the tragic theft of 18th century paintings by Tomás de Merlo from a Guatemalan church, modern artists have provided replacements. They are not copies, but are personal interpretations of the themes. It shouldn’t come as a surprise to anyone that Mexican artefacts are being illegally sold online. This is a rather angry article that gets several facts wrong. The situation isn’t great in Mexico but take this with a very large grain of salt. The doll was taken from a display in the tribe’s cultural center within its casino. It is a modern doll but of cultural significance to the tribe. Thirteen Native Alaskan items were taken from a display case in the admin headquarters of the Yukon-Kuskokwim Health Corp, a Native-run organisation. The 72 valuable prints by Momaday, a Kiowa artist, may be stolen, say police, because of the apartment is a former meth lab. The thief who stole and returned Dalí’s Cartel de Don Juan Tenorio was caught after he was finger printed stealing juice from a supermarket. “Operation Artemis” started after part of a fresco was stolen from House of Neptune, at Pompeii. Police found 550 objects in a house and three people were arrested. The story of the 1981 theft of significant religious objects from the old cathedral of Vitoria. The vessel was ‘gifted’ to some sort of charity set up by a conservative peer and is employing Odyssey Marine of totally looting of other shipwrecks fame. MP Kevan Jones has called Odyssey Marine a scam. Professionals have criticised the undertaking. The Becchina connection to UK museums shouldn’t be a surprise to anyone reading this. The Vatican has launched a new digital platform that is meant to keep its art under constant monitoring. Did you know that one of the soldiers that looted China with Lord Elgin Jr. brought back a Pekinese dog, named it “Looty” and gave it to Queen Victoria? Seriously folks. A crown and other decorations were stolen from a goddess at Gajjela Papamma Temple, Hyderabad. I would hope so! Also, what about the temples? That is in North Goa alone. Locals feel this is hurting religious practice. No arrests have been made. There has been a spate of shivaling thefts in Agra, but some were later found dumped in various places. This is for the theft of Radha and Krishna idols from Radhakrishna temple in Odisha’s Rayagada town in 2013. The men were caught trying to sell the idols. Three artefacts were stolen from the Mundeshwari temple in Kaimur District: the oldest Hindu temple in Bihar. The thieves took a tikuli made of silver, two eyes of a goddess idol, and a silver canopy. 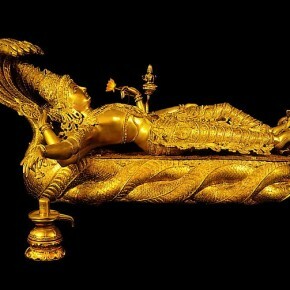 A famous Shivalina was stolen from the temple a few years ago but was returned. Ignore the title. Police have announced that the mummified monk was stolen from a cave in Kobdsk, trafficked to Ulaanbaatar, and there were plans to take him across the border to sell on the black market. The statue is thought to be around 300 year old and police think they meant to smuggle the piece into India via Nepalgunj. Police say they are organised idol smugglers. The exhibition is called “Looted art returns to the motherland: Thai artefacts from the United States”. The three men were stopped at a Byzantine-era tomb with digging equipment and a metal detector. They said they were searching for worms. The UN moves to ban all trade in antiquities from Syria while a) ignoring the rest of the world and b) not specifying how they will determine an antiquity is Syrian. A book of letters of regret that have accompanied the return of stolen fossils to the Petrified Forest. I bought this one instantly. A not so glowing review of “Don Verdean”.